Rebuild Manhattan's famous skyline in three dimensions using scale-model buildings, while adding a fourth dimension... time! The New York, USA 4D Puzzle from 4D Cityscape includes 120 building replicas that depict the city as it appeared as far back as 1812 through to 2013 with the completion of the One World Trade Center (Freedom Tower) - 101 years of architectural history! 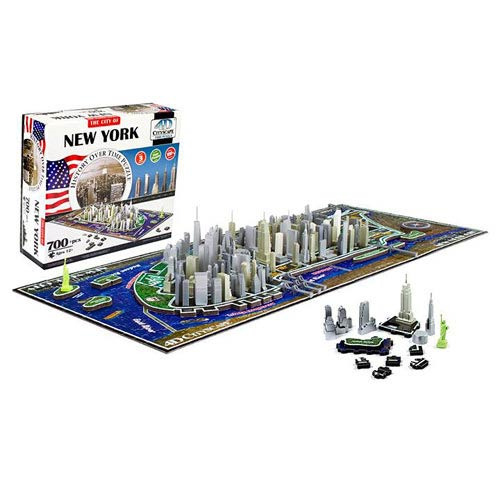 Includes such iconic structures as the Statue of Liberty, Empire State Building, and the United Nations; the buildings fit into pre-cut holes in a traditional 2D jigsaw puzzle composed of 840 pieces that form the city's street layout and islands. The streets glow in the dark, emphasizing the city's insomniac nickname. Includes a Time Poster that includes a history of the city. The online educational feature includes more than 2,000 facts. Ages 12 and up. Assembled measures 28-inches long x 12-wide x 4-inches tall. Ages 8 and up.